After Droid and Droid X, Motorola today announced Motorola Droid 2, an upcoming Android smartphone for Verizon Wireless customers in USA. The Motorola Droid 2 is a CDMA handset designed to work with 2G CDMA 800 / 1900 and 3G CDMA2000 1xEV-DO networks. Powered by the latest Android 2.2 Froyo, the Motorola DROID 2 includes customized MotoBlur user interface. 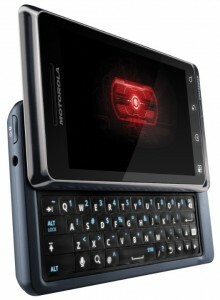 Motorola Droid 2 A9552 is far powerful than the original Droid and has an improved QWERTY keypad. However, the device specification shows that its inferior to the recently released Droid X. Motorola Droid is much famous for its advertisements that compare itself with the iPhone 3G S. The new device is introduced at price very similar to the iPhone 4, and is a considerable upgrade. The external dimension of the new Droid 2 is very similar to the original Droid. However, as you can see from the photos, the Droid 2 has an improved QWERTY keypad. It’s now easy to type emails and text messages, update social media statuses and access websites. Other than this there is Swype, an innovative touch screen input application designed to work with QWERTY devices. Therefore, the Droid 2 enables error free, fast typing with great flexibility. Droid 2 includes a 5MP camera with auto focus, face detection and video recording. The new 1GHZ processor provides much powerful experience than its predecessor in loading web pages and multitasking. Droid 2 ships with the Adobe Flash player 10.1, which along with multi-touch input support will provide excellent web browsing experience. Motorola Droid 2 has the 3G Mobile HotSpot capability, a feature that is also available in HTC EVO 4G and few other smartphones. Apart from these, it also supports several new features introduced in Android 2.2 Froyo. Other specifications of the device include 8GB internal memory, 8GB MicroSD card, storage expandable to 32GB, Google apps, Blockbuster mobile for downloading full length DVD movies, Skype, Bluetooth 2.1 with A2DP, Wi-Fi, DLNA, TV-out, 3.5 mm headphone jack, A-GPS and Li-Po 1400 mAh battery. Motorola will launch Droid 2 in August 11, and it will be available at the Verizon web stores, from the same day onwards. The suggested price of Droid 2 is $199 after $100 mail-in-rebate and with a two year customer contract. Droid 2 customers should subscribe to a Verizon wireless Talk & Text plan and Email and Web for Smartphone plan. Those to want to use the 3G hotspot feature of Droid 2 should pay additional $20 per month. Motorola already launched the GSM version of Droid as Milestone in India and other world countries. We expect them to release a Milestone 2, any time soon. When will Moto Driod X will be launched in india? Im very much interested in that mobile. I hope, Motorola will soon give Indian market DROID 2.